Being injured is never fun, especially when it impacts your mobility. When suffering from a leg, knee, or ankle issue the typical solution is crutches. But, using crutches often does not keep weight fully off of your injury and can be very cumbersome and annoying. 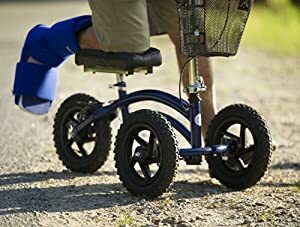 Adjustable wheeled knee scooters have been gaining popularity and can provide a dependable, reusable alternative to crutches. One of the biggest benefits of knee scooters it that they can move quickly and effectively without putting too much strain on your upper body. 5. 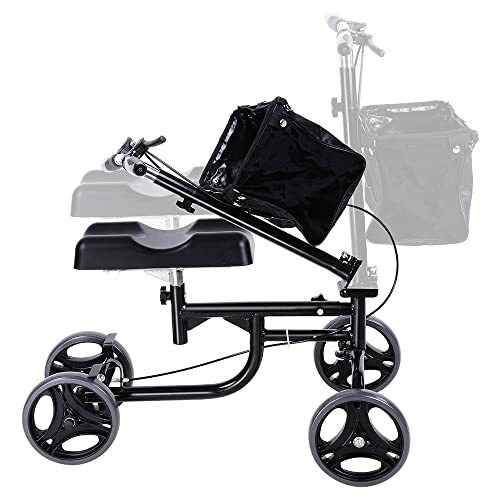 AW Adjustable Knee Scooter Walker w/ Basket Steerable Rolling Wheel Weight Capacity 300 lbs. 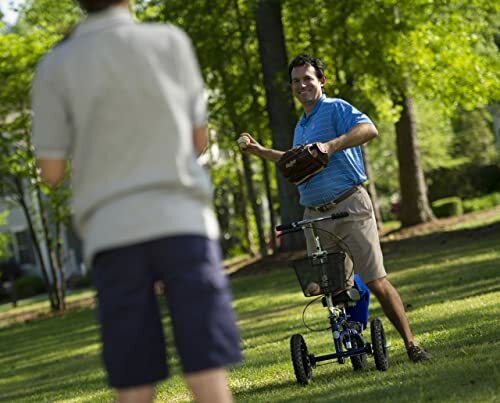 Here, we have a review of five options to consider when looking at a knee scooter walker. Some are a better deal than others and some have more options, it comes down to how much money you are willing to spend, how long you plan to use the scooter, and how mobile you need to be in your day to day life. Drive Medical DV8 help user to feel very confident when moving from room to room and provided that extra layer of confidence when outside. The Drive DV8 Aluminum Steerable Knee Walker Scooter is one of few adjustable scooters that has a clear advantage over other scooters. On a basic level, most scooters used for medical purposes are roughly similar – they perform basic functions and get the job done. But what separates this scooter from the rest of the pack is its handlebars and the shaft that supports them. The system is incredibly stable and supports users who wish to sit in a stiff upright position. This allows the user to feel very confident when moving from room to room and provided that extra layer of confidence when outside. This is the best thing about this scooter. The scooter has dual wheel brakes with locks, and also features a push button brake lock system for parking and long term storage. It folds easily although it does not get very compact – when storing in a small area such as a closet or car, dedicated space is required. Aside from the stiff shaft there is not much of an advantage to this product over the others. Price wise, it is comparable. Not super cheap but not a total rip off. When parking, make sure to apply the push button break because otherwise the device may begin rolling with only a slight amount of pressure applied. The no-tool seat adjustment is convenient and easy. This makes it possible to sit nice and high on this scooter, getting as close to your normal walking height as possible. This product is best used around the house or for light office work. It is not something to use for a more active lifestyle. Steerable Knee scooter lands at the bottom of the totem pole. Balance is something to keep a keen eye on with this product- otherwise you are pebble away from tipping over. The stability of this scooter is not up to par with the market standard. While the height and weight capacity are adequate, this product is best used around the house or for light office work. It is not something to use for a more active lifestyle. Additionally, you may notice the brakes squeaking very badly- if this happens, spray a good amount of WD-40 on them. The pad does not turn to get close to the counter. 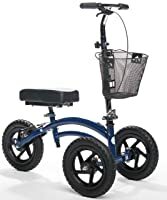 On the plus side, this scooter is among the cheapest you will find, making it a viable alternative to crutches or a walker. As far as riding on carpet, this scooter seemed to handle as well as the rest. Same goes for linoleum or tile, but be sure to keep the balance issue in mind. Sharp turns or putting significantly more weight on one side than the other will easily cause this scooter to sway and possibly topple. Of all of the scooters, this one appears to be the most cheaply made and thus the most likely to cause problems. The rider will feel confident in every situation, from basic indoor maneuvering to rolling around the office at work, even taking dogs or kids up to the park for a walk. 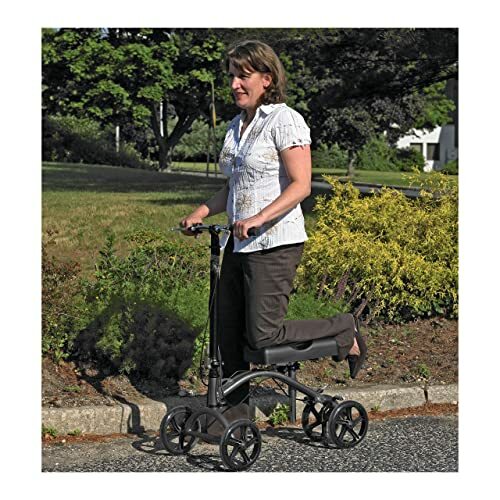 As opposed to the previous scooter, Deluxe Steerable Knee Walker Knee Scooter is incredibly stable. Another plus to this scooter is the durability. If the rider needs to travel, this device is a good option. When flying, it is possible to compact the scooter enough that it fits into a suitcase, avoiding an additional bag checking fee. For a road trip, the folded scooter sits in the trunk of the car – because it folds and unfolds so easily, it does not overload your luggage or otherwise get in the way. The way that this scooter is built is very solid – no problems with the brakes, the tires, or the body. It seems as though this thing could take a beating and still get the job done. There is not an emergency brake on this scooter, which is a downside, but the regular hand brakes work well enough. Make sure to store it on a flat surface if you do not plan to break it down. Be sure to avoid a sudden clamp on the hand brake – if you must stop quickly, grasp hold of the brake and ease into it as though you were driving a car that began slipping on the snow. Some scooters feel awkward depending on the user’s body type and weight- you will not have that problem with the scooter. Plus sized and pear shaped riders will feel comfortable and confident. On carpet, tile, our outdoors the tires and shocks ate up any bumpiness in the ride, avoiding any extra strain on my injury. This product is undoubtedly the best for outdoor riding. On slopes, the three wheels seem to help maintain balance better that the traditional setup. It also absorbs shock very well. This scooter only has three wheels, which accounts for its smooth balance and ride. The wheels are also 12 inches tall, a good four or five inches bigger than on most scooters. The best part of the knee rover is that is has a bit of an all-terrain look and feel. This product is undoubtedly the best for outdoor riding. On slopes, the three wheels seem to help maintain balance better that the traditional setup. It also absorbs shock very well. If you find yourself moving from sidewalk to street quite a bit during your daily commute, this is definitely the product you want to buy. The same goes if you have a work schedule that necessitates a lot of moving around. This product is the most recreational of all scooters. Unlike many others, it handles well outdoors. The brakes do not lock, so be careful not to store on a slant. 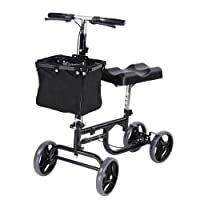 The lightweight steel frame makes for easy transport and storage, although the large wheels can be annoying during storage. This scooter is the first one to implement such large wheels- what they could do better is make at least the rear one detachable like that of a bicycle. The biggest down side to this scooter is the price- coming in around Currently Not Available*, it is one of the most expensive scooters on the market. But it can be worth the cost if you plan to be using it for quite a while, or if your injury is something that may need more treatment down the line. Once you make the initial investment, this product will last a lifetime. It is simple and compacts very nicely for mobility and storage. If you drive, you can easily fold the scooter and fit it on the floorboard in front of your passenger seat. AW Adjustable Knee Scooter has a great balance. Its price is also right in the middle range. The lack of information on the web makes it seem as though it is a relatively new product. The overall feel is subpar when compared to top of the line products. It can feel clumsy, and takes time to get comfortable on. What you get with this scooter is an average, standard scooter that focuses on getting basic jobs done and leaves the showboating to more expensive products like KneeRover. 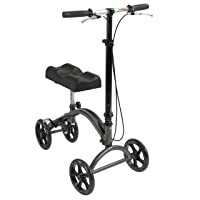 This scooter is best if you only need it for a short time- say you broke your ankle and will not have full mobility four 6-8 weeks. Anything longer, you will want to look at a better scooter. The basket and build are nice on this one, though. It is simple and compacts very nicely for mobility and storage. If you drive, you can easily fold the scooter and fit it on the floorboard in front of your passenger seat. The brakes got a bit sticky after a while and the wheels were more wobbly than I would have liked. Because of the sticky brakes you may want to attach a bell or something if you ride in public a lot- you may find yourself holding up traffic. With these five products, two of them stood out from the rest in most categories- the All-Terrain KneeRover and the Drive Medical DV8 scooters. These two are the best options, quality wise. 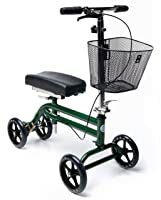 If price is the deciding factor or you only need the scooter for a short period of time, you will want to go with the AW Adjustable Knee Scooter. It’s industry standard functions and moderate price tag will satisfy your needs and help you to a speedy recovery. It isn’t flashy and has no features that are over-the-top awesome, but is a reliable option in the interim. 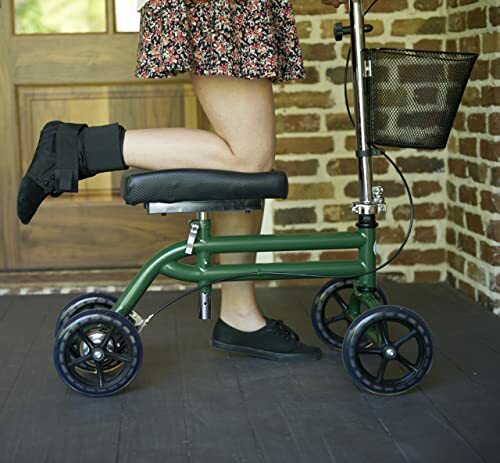 A step ahead of the AW is the Deluxe Steerable Knee Walker. This scooter looks good and has a good vibe both indoors and outside, and at a price tag of right around Currently Not Available* is not going to break the bank either. If you are looking to buy a gift for someone, this is a good option because at first impression it looks to be a bit more expensive than it actually is. This scooter also suffices for moderate outdoor use, though it is not nearly as rugged as the KneeRover. Then we move on to overall performance. The KneeRover is, to make it relatable, the ‘Luke Skywalker’ of knee scooters. It has all of the makings of an industry leader and has rebelled against the norm by reducing the wheel count from four to three. If you are looking for a scooter that will allow you to maintain as close as possible of a relationship to your un-injured lifestyle, the KneeRover is the undeniable winner here. You will look and feel much better than you actually are. In all categories except for price, the KneeRover takes the cake. The Drive Medical DV8 is a close second- it has all of the bells and whistles but retains the fourth wheel, which can actually be better for those who are older and/or not quite as sure of themselves when it comes to balance. The price tag is a little lower. 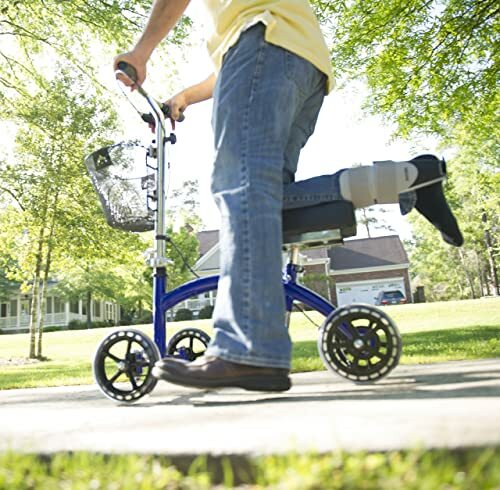 Both the Drive Medical DV8 and the KneeRover will last for the rest of your lifetime without need for replacement- making them the best options if you have a situation that may see you heading back to the hospital multiple times over the years. Let’s cut out three of the five scooters right now- the KneeRover knocks out the Drive Medical DV8 in the quality category, and the Walker wins for moderately priced but dependable. Now that we are down to these two products, you just have to ask yourself whether you are more interested in long term dependability and the market’s top quality product, or if you would rather save a few bucks and go with a step down in overall rating. It should be noted that both of these products will get the job done, but the KneeRover does it better and is perfect for those with an active lifestyle. If you are unable to avoid work and other responsibilities during recovery time, the KneeRover is the best fit for you. This knee scooter delivered everything needed, and in the end you will be glad that you spent the extra money for a superior product. Again, think about your long term situation- do you have additional surgeries scheduled? Will there be more downtime down the line? If so, the KneeRover is the way to go. If not, save a few dollars and buy the Knee Walker.